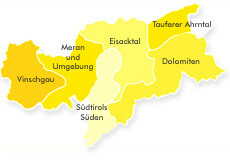 The Valle Isarco extends from Bolzano to the north up to Brennero/Brenner. The Isarco Valley is an ideal cycling and hiking region. Here you can find numerous hiking paths and mountain-bike routes with different levels of difficulty. In winter, the region attracts skiers, snowboarders and cross-country skiers. Reasonable family offers can be booked during the "White Weeks" with ski kindergarten. This is where thousands of years old Mediterranean and European/Nordic influences meet, which can be seen and felt in the guesthouses, the villages and the towns of Vipiteno, Bressanone and Chiusa. The region also offers many impressive works of art from renowned architects, painters and sculptors from all style epochs. Culinary delights- numerous restaurants and guesthouses along the Isarco Gourmet Road offer traditional dishes combined with influences from Austrian and Bohemian, and also Mediterranean cuisine. Enjoy your meal accompanied by a good glass of wine from the Isarco Valley, which is renowned for its white wines. A highlight of the region is the "Törggelen" tradition in autumn, when local specialities and the "new", young wines are offered in the traditional wooden rooms of different farms and guesthouses. Worth a visit during all seasons of the year. In winter you can enjoy the small, yet interesting ski resorts Plose, Racines, Monte Cavallo and Ladurns. Bressanone with the beautiful Dome Square and Vipiteno are ideal for shopping. Also visit the Mining Museum in Ridanna or the Aquarena Adventure Pool in Bressanone.